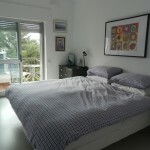 This entry was posted in Carcavelos, Carcavelos Holiday home, Family, Lisbon and tagged Carcavelos, Holiday, Lisbon. Bookmark the permalink. We came to Lisbon to celebrate Jenny’s 60th birthday and spent a very enjoyable week in Brid’s apartment that regretfully flew by far too quickly. John has experience as a geographical analyst – pulls lots of data together to determine the optimum location for some particular purpose. He surmises that Brid may have also exercised a degree of geographical analysis to end up in a similarly optimum location – close to a railway station, 20 mins to Lisbon’s Cais de Sodre station, 10 mins to Estoril and 15mins to the end of the coastal line at Cascais, 500 metres to Carcavelos beach and within easy reach of Sintra in the Serra hills, also in close proximity to a supermarket and numerous cafes and restaurants. Transport links were so good that for once we didn’t need to hire a car to mount our exploration. 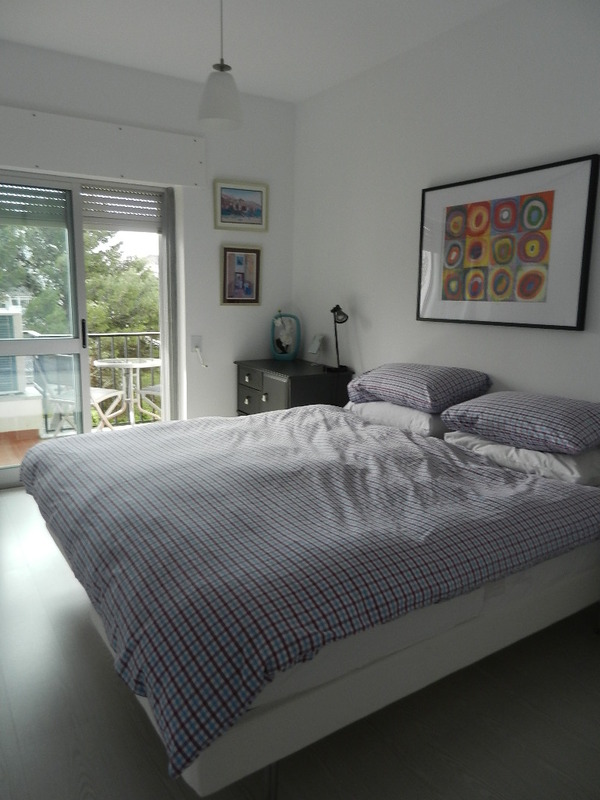 The neighbourhood is also quiet at night assuring a good night’s rest lying in the comfort of a memory foam mattress. So to our highlights, most of which are depicted in our photo link below. Being a rather special birthday we needed a rather special restaurant to celebrate, somewhere that could reflect the true flavour of our location and nothing too pretentious. Using her inept geographical analysis skills, Brid discovered Ponto Final, a rustic establishment on the south shore of the Tagus about 1km upstream from the April 25th Bridge which offered a splendid selection of fish dishes. There’s lots to see in Lisbon and we wanted to leave time to explore some of the beaches and Sintra, so a case of rationing. A 15 minute train ride to Belem is all that is needed to take in a number of sights in this district, our highlight being Jeronimos Monastery. Within the monastery there is an interesting historical timeline exhibition which serves to remind those of us who have been educated on a diet of British history that the rest of the world also has a recorded history, and we left a cut down copy of this display in the apartment to interest future guests. Note the monastery is closed on Mondays. Also in Belem we visited the tropical gardens, Jardine do Ultramar, although a reflection of faded glory we discovered an interesting but very low key exhibition recounting past Portuguese colonial exploits from a scientific point of view, we think this may be a temporary exhibition so check if still on before setting out. The beaches are a voyeurism spectacular, particularly at weekends when half the population of Lisbon of all shapes and sizes appear to descend upon the 20km tract of golden sands to work on their tans. However being hillwalkers at heart, we were keen to see a little of the Serra hills in and around Sintra. We were not disappointed and so enthused that we devote two days to exploring the delights of this area where the great and the good once retreated from Lisbon during the summer months. We didn’t have time to explore all but recommend the Moorish Castle, the grounds of Parque e Palacio da Pena (a myriad of trails through the predominantly pine covered hills rising to 532m above sea level and offering extensive views), the Palace and grounds of Monsterrate and Quinta da Regaleira. The latter is an absolute must if you need to entertain the kids or re-engage with childhood fantasies as the original designer of the grounds must have done.